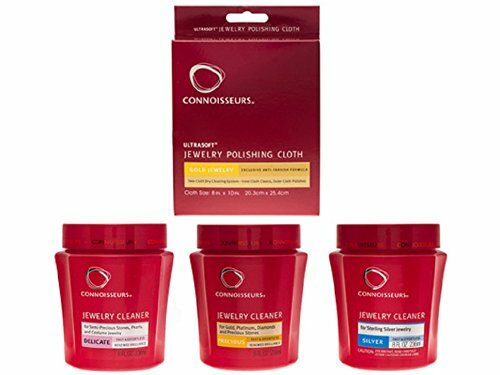 Contains 1 Each Of The Following: Precious Jewelry Cleaner (8oz), Silver Jewelry Cleaner (8oz), Delicate Jewelry Cleaner (8oz), Gold Jewelry Polishing Cloth 8 X 10. The Precious Jewelry cleaner has a revitalizing formula that adds striking brilliance to diamonds, gold, platinum and other precious stones and has a pleasing fragrance, includes dip tray and touch-up brush, improved jar dynamics allow users to dip jewelry without getting fingers wet, and has the Good Housekeeping Seal. The Silver Jewelry cleaner has a revitializing formula to remove tarnish quickly and easily from sterling silver jewelry and has a pleasing fragrance and also has an improved jar to allow users to dip jewelry without getting fingers wet, includes dip tray. The Delicate Jewelry cleaner has the improved jar to allow users to dip jewelry without getting fingers wet, has the Good Housekeeping Seal, pleasing product fragrance, and is specially formulated to clean pearls, opals, and other delicate stones and fashion jewelry. The Gold Jewelry Polishing Cloth safely cleans gold without scratching, 2-ply cloth made of 100% cotton flannel, inside cloth cleans and polishes and outer cloth buffs. If you have any questions about this product by Connoisseurs, contact us by completing and submitting the form below. If you are looking for a specif part number, please include it with your message.